What is time? From Einstein to college students lighting up in their dorm room, this is a question that’s been asked by plenty of people to varying degrees of success. Now, Canadian filmmaker Peter Mettler takes a stab at this heady topic with his 2012 experimental visual poem (it’s tough to call this a documentary), The End of Time. The lava flows in Peter Mettler's The End of Time. But the Tree of Life comparison also works in the positive sense, for the bulk of The End of Time is actually something quite special. Mettler takes us from the CERN particle accelerator to Hawaii to Detroit to India to outer space, finding interesting moments and stories in each location that, collectively, do get you thinking about time and human existence. A tale of the last man standing in an area of Hawaii that is slowly but surely being reclaimed by an active volcano is pretty gripping once you realize what’s going on… and the four-minute­-long shots of flowing lava, given this context, are both fascinating and horrific. Similarly, cutting from an Indian burial ceremony to a shot of ants working together as they drag the carcass of a nearby grasshopper (while we still hear the sounds of the funeral) is nothing short of genius; these kinds of “oh wow” moments are peppered throughout the film and worth the wait. Though the snail’s pace might turn plenty of people off, those who allow their mind to slow down and tune into the film’s wavelength are richly rewarded with a beautifully crafted collection of images and sounds, mostly filmed and assembled by Mettler himself. While his cinematography is solid, it’s the sound design that turns The End of Time into a memorable experience, seamlessly taking you from one moment to the next, one location to another. This being a movie about time, of course, it’s only logical that the film’s structure should play with pacing and rhythm—but Mettler does it with a skill that leaves a very personal stamp on such a big, universal topic. 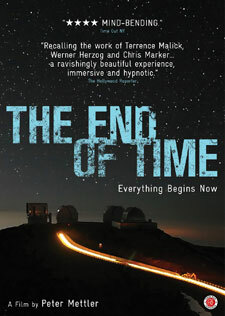 If you can weather the plodding beginning and ending, The End of Time is a definite winner. The DVD provides an additional commentary track that brings you further into the mind of Mettler’s approach to this grandiose topic.